53 members and guests joined the coach at Hamworthy Club for a 9.00 am start on our visit to the Brooklands Museum and Mercedes Benz World. After a 90 minute journey we arrived and after entering as a group split into individual or small groups to explore the site. The change made during the multi million pound re-development were very much in evidence and made the visitor experience very enjoyable. Some members, not having visited before were surprised at the steepness of the banking of the old track, now not looking its best with cracking and moss very much in evidence. The refurbishment of the old hanger (housing the "Loch Ness Wellington" once flown by Terry Mobley's father) and the addition of the new hanger enable more items to be displayed. 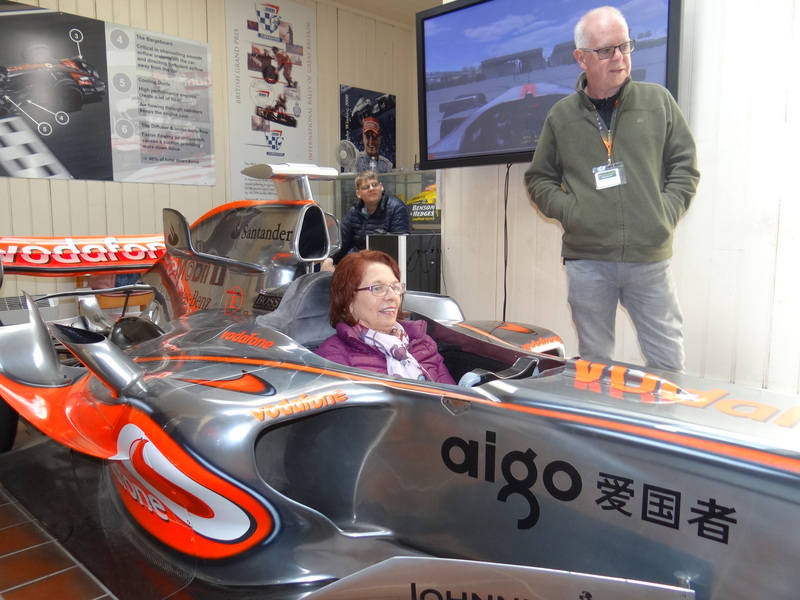 The aircraft park and the London Bus Museum are also very much worth a visit, many members tried their hand at the high speed simulator, with Poppy Garvey attaining a very good time, beating many of the men, including her husband Alex and Terry Mobley, Poppy reached a speed of 220 mph and stayed on the track! All in the entire museum is an excellent day out. Many members took the short walk across the site to the Mercedes Benz World. A superb building on three floors exhibiting all current model vehicles, a few older models and a superb piece by piece breakdown of an F1 car ,all 3250 pieces suspended by wires. Around the building they have placed a skid pan, s short high speed track and an off road experience course. Our party were all agreed that it was a day out well spent and our thanks go to Chris Adamson for organising it for us.